Having a hen night is the traditional way to say good bye to life as a single lady before you settle down to married bliss! Over the past few years we have seen more and more innovative and exciting hen night ideas which have helped brides to be create some fabulous memories with their closest friends. Of course each hen night is as individual as the bride herself but if you are looking for some hen night inspiration here are some great ways to celebrate your last night of freedom. If a night out on the town isn’t your thing and you’d like to have a hen do where you learn something then why not consider a creative craft session with your girlfriends. From cupcake creations to still life drawing, pottery painting or even metalwork choosing a craft session is a really popular hen night option. The lovely thing about this idea is that you’ll also have something to take away with you at the end which will always be a memento of this occasion. Having a craft for everyone to focus on is also a great way to break the ice if you have a variety of friends attending who might not know each other. Planning a wedding can leave you feeling pretty frazzled so a relaxing spa break can be the perfect way to relax and recuperate before your big day. Many spas offer brilliant hen night packages that include treatments, dinner and even a glass of bubbly whilst you chill out. Staying at a hotel also means that your friends can enjoy themselves without having to worry about getting home at the end of the night. A chilled out spa day is a real treat for the bride to be and is also a great idea if you are inviting older relatives along who might not be so keen on clubbing! If you like an adrenaline rush then why not splash out on an all action hen do. This is brilliant fun and will certainly get your wedding party bonding together. There are a whole range of both indoor and outdoor action options if you fancy getting active. Why not try a high ropes course or paintballing if you love the great outdoors. Alternatively if the weather is not looking good you could experience the thrill of indoor go-karting or fencing. Whatever option you choose don’t forget to add those special touches to your hen do to make it a really memorable occasion – and we’re not talking about a veil and L-plates! You could consider having a vintage ice cream van turn up at your venue to provide luxury ices to your hen party, or maybe you could all travel to your hen night in a limo. 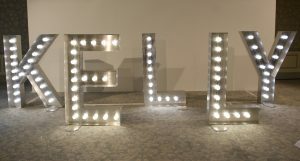 Or why not hire out giant illuminated letters to spell out the hen’s name. They are a stunning centrepiece and will look great in your photos too. We love hearing all about your hen do ideas so if you have any unusual or quirky hen night plans then let us know about it on our social media pages.